Dockside Green Phase 2 Tied As Highest Scoring LEED Building In The World! 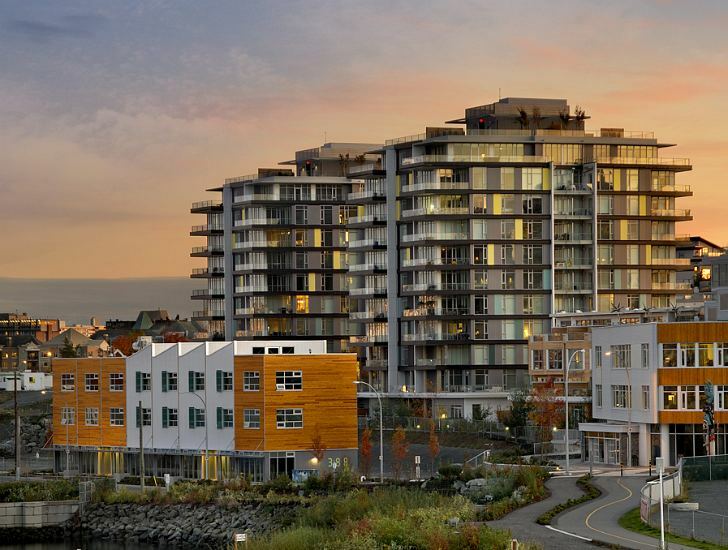 The second phase of Perkins + Will's Dockside Green in Victoria just received its LEED Platinum certification this week. Not only is it the highest scoring building in the world right now, but it's tied with Synergy, Phase One of Dockside Green just next door. Dockside Green Balance, a collection of one and two bedroom condos and townhomes, is part of a large redevelopment of an industrial waterfront into a LEED Platinum mixed-use neighborhood. Now that both phases of the project sit at the top of the LEED scoreboard, the dynamo project could rightfully be named one of the greenest projects in the world. Perkins + Will recently celebrated their 75th anniversary as a firm, and is well-known for their green projects. In fact, Dockside Green Phase Two is their 100th certified LEED project, and combines commercial, residential, live/work and light-industrial uses. The project focuses on a close connection with nature and the waterfront and features an abundant use of natural daylighting in all of the homes. A green belt runs throughout the entire project and includes hanging gardens, an abundance of trees, a living wall and water features. Phase Two of the super green project included the construction of two, 10-story mixed-use residential towers and a row of townhomes. The project includes the use of 100% fresh air system with heat exchange, a four-pipe fan coil system, low E double-glazed windows, exterior blinds, Energy Star appliances, CFLs and LEDs, occupancy sensors and solar landscape lighting. 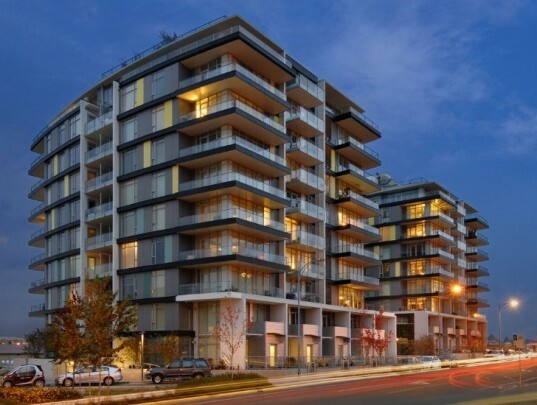 The developers of the project, Vancity and Windmill West had pledged that if the project fell short of their LEED Platinum goal, they would pay a one million dollar financial penalty. Guess they’re off the hook for this one. Perkins + Will recently celebrated their 75th anniversary as a firm, who is well-known for their green projects. In fact, Dockside Green Phase Two is their 100th certified LEED project, which combines commercial, residential, live/work and light-industrial uses. The living wall at Dockside Green Balance. The project focuses on a close connection with nature and the waterfront and features an abundant use of natural daylighting in all the homes. A green belt runs throughout the entire project and includes hanging gardens, and an abundance of trees, a living wall and water features. Phase Two of the super green project included the construction of two, 10-story mixed-use residential towers and a row of townhomes. The project includes the use of 100% fresh air system with heat exchange, a four-pipe fan coil system, low E double-glazed windows, exterior blinds, Energy Star appliances, CFLs and LEDs, occupancy sensors and solar landscape lighting. A green roof at the sister project, Synergy. A row of townhomes for Balance. The developers of the project, Vancity and Windmill West had pledged that if the project fell short of their LEED Platinum goal, they would pay a one million dollar financial penalty. Guess they're off the hook for this one.